Actually, it's a bag within a bag! How cute is this little purse? 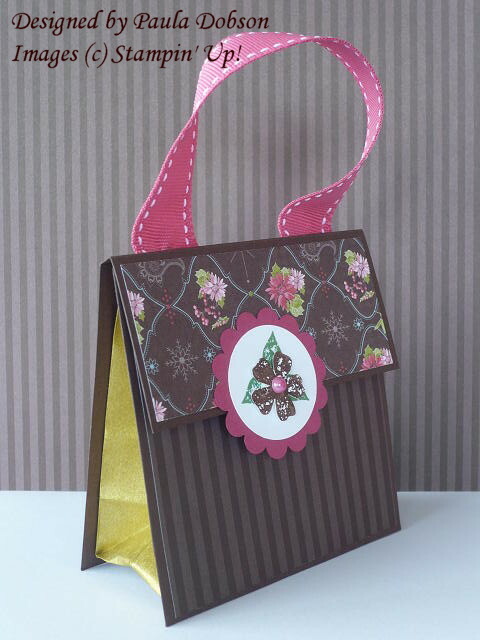 This is a great gift holder or a gift in itself, that is quick and easy to make. I will be holding a class in April on this wee project, so if you would like to learn how this is done, come along. Check the class list on the right side of my blog for the date, which I will post up in the next couple of days. Lets face it, who doesn't like collecting handbags?!! I have used some of the new items in the Winter Mini catalogue, which is being released on the 1st of April, along with some tried and true product out of the main Idea Book & Catalogue. Stampin' Up! take a lot of guess work out of your projects, because everything just mixes and matches so well! Come along to my Release workshop on the 10th of April to see the yummy new products I have used here. Please register your interest in attending by using the "Contact Me" section on the right! A wee reminder also, that the SAB period ends on the 31st of March, along with the Summer Mini Catalogue. So if you have items on your wish list you have yet to get, then contact me before the end of the month and place an order, so you don't miss out!! Very cute, Paula - aren't they fabulous to make!? Quick and easy, perhaps, but beautiful nonetheless! Gorgeous Paula...I havent used that paper since Christmas but it really is versatile as you have shown so well here! I'm loving the bag, so cute and pretty.